Those moments in life when you feel a genuine connection with another person are few and far between; I’m talking about that moment you realise that there’s someone thinks the same as you, has the same values and ideas. Often it can come from books, for me it came through music and the person who made everything make sense was Andy Kershaw. As a teenager I did not follow the crowd; I had my own firm ideas about what made good music and those ideas were fueled by Kershaw’s Radio 1 broadcasts. You might say I grew up with Kershaw; as the content of his shows grew wider and his travels took him all over the world so too did my musical (and often political) horizons expand. Did I mention I also had an enormous crush on the man too? “No Off Switch” is an autobiography I’ve been eagerly awaiting for a long time. The shelves of bookstores real and virtual teem with so-called celebrity autobiographies but few of them can offer the stories that Kershaw has to tell. In professional terms the man has led a charmed life; personally he hardly covers himself with glory here but for his loyal admirers (and as he has carried his audience from Radio 1 onto Radio 3 and 4 his audience have grown up with him just as I did) there’s little here that will change their opinion. 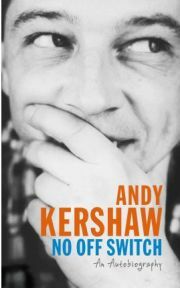 Kershaw has always been outspoken, both in his contempt for the mass-marketed brainless drivel that the music industry peddles, and for the media that accept and promote it, and it’s an attitude that prevails throughout the book. The Beatles he dismisses as “unexciting” while Elvis is “plastic” (and as this reader thinks that Elvis was an over-rated pub singer, Kershaw’s opinion only amused me). Simple Minds and Boomtown Rats fans should probably make a point of avoiding this book though Kershaw’s account of his first meeting with Bob Geldof is one of the highlights. Born to head-teacher parents in Rochdale in 1959, Andy spent much of his childhood in the company of his older sister, Liz (known throughout the book as “Our Elizabeth”), in the care of his grandparents who, it seems, were more affectionate than his parents. He was a self-reliant child who was perfectly able to entertain himself and he spent his childhood and adolescence absorbed in a number of pastimes that became lifelong passions. While hardly a rebel, he was certainly a headstrong youth who knew what he wanted to do and made sure he did it. He recounts how, on his first day at Leeds University – then recognised as the university putting on the best gigs – Kershaw found the Entertainments officer and told him that one day he wanted his job; for the meantime the enthusiastic youngster was signed up as an events steward and crew member but he did, of course, in due time become Ents Officer himself, organizing some memorable gigs and it was Kershaw who was responsible for Leeds gigs opening up to non-students, a particular milestone at the time. The rest of course is history; a brief spell at Radio Aire was followed by a stint as “road manager” (given some of the hotel dives they stayed in around Europe the term is perhaps rather grand) for Billy Bragg – Kershaw had been sent a copy of Bragg’s “Life’s a Riot…EP” and contacted Bragg to say how much he’d liked it – and before long he was being lined up to present BBC television’s flagship music show “The Old Grey Whistle Test” and, when that programme ceased to be, the start of what was to become a long relationship with BBC Radio. Kershaw’s stories from the period are funny and engaging although there are those, I’m sure, who wouldn’t appreciate Kershaw’s bluntness. There’s a marvellously compelling chapter in which Kershaw describes what it was like to spend a fortnight working for the Rolling Stones, and another brilliant piece of writing that documents his many visits to Haiti, a country he is clearly fond of. But frequently, a new and darker Andy rears his head. Kershaw’s much documented (in other places) stretches in prison for harassment and breaking of an injunction taken out by Juliette Banner , his former partner and mother of his children, don’t crop up until several hundred pages in and when they do, we see plenty of evidence of a broken and desperate man, but sadly no real insight. I had expected a bit more self analysis from the Kershaw but gradually I came to realise that a man who refers gleefully to “leg over” at every verse end isn’t one for introspection. His repeated acknowledgement that he is indeed a bit of a swine when it comes to his treatment of the female of the species struck me as rather pathetic but such is the quality of the writing on music and travel that I was willing to forgive these transgressions. If his summation of a seventeen year relationship with Banner in little more than a paragraph is surprising, his views on long time Radio 1 colleague, the late John Peel may astonish many readers. Far from heaping praise on the man who is, to many, an icon, Kershaw is scathing in his appraisal and, although I’m inclined to agree on several points, I was surprised at how vociferously Kershaw expresses himself. At times boorish and arrogant, certainly selfish and crude, but always erudite and fascinating, Kershaw is a man with many stories to tell. In “No Off Switch” Andy Kershaw reminds us just why he’s won so many accolades and why, in spite of his personal issues, he has once again become a much loved broadcaster with an infectious passion. I thoroughly enjoyed this book and will re-read it time and again. Clumsy and oafish, but still the man I fell in love with more than twenty years ago, Kershaw is entertaining and honest. He may not pick up any new fans with this autobiography but those who share his love of authentic, worthwhile music will love it. With thanks to the publisher for supplying a review copy. No Comments on "No Off Switch"